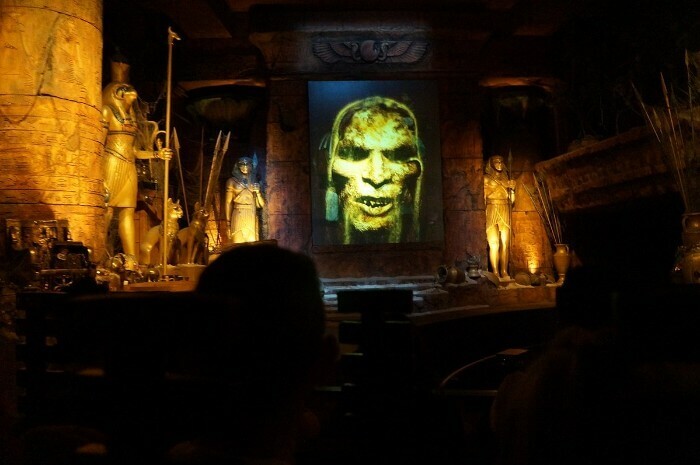 Based on the successful and in our opinion very good Movies the Revenge of the Mummy Ride is a highly themed, technologically sophisticated indoor dark coaster that is much applauded within the industry. 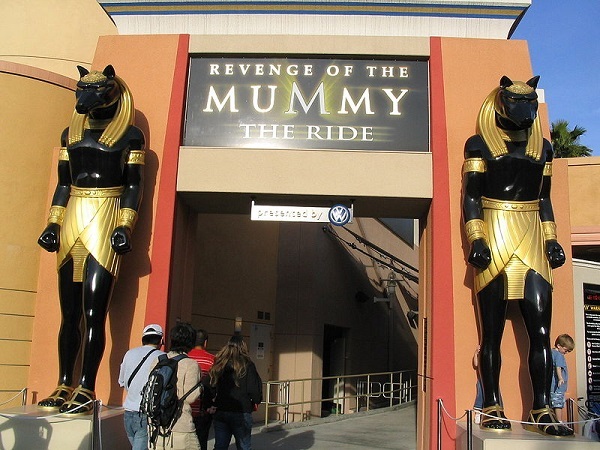 Our Revenge Of The Mummy – The Ride Review takes a ride on this highly decorated coaster and explains why we find it less appealing than its reputation suggests. 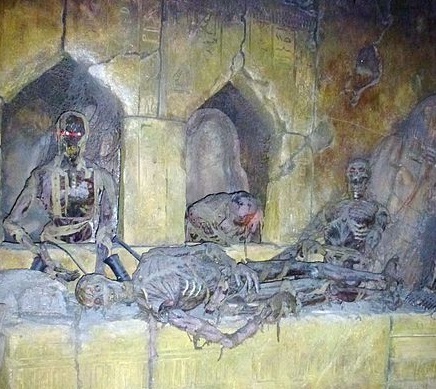 What is the Revenge of the Mummy: the Ride? The first time we rode the Mummy we were really excited. The Ride has won numerous awards and received rave ratings including back to back wins of “Best Indoor Rollercoaster” for 8 Years in a row! We love the Mummy Franchise and the idea of riding a rollercoaster around in the dark while being chased by Mummies was a big draw. All we can say is it’s a big disappointment for us. And for one reason, it really is violently rough! While the Hollywood layout is better than Florida, which in our opinion is un-ridable. It still has some nasty jerks and twists that come completely out of the dark and are Jarring and painful. We have never experienced a roller coaster this rough, and we have ridden the Big Apple Roller coaster at New York New York, Las Vegas! And we do not normally have issues with ride discomfort, but something about the rock hard seats that sit you at an odd angle, and the violent jerks that are completely unseen left us in significant pain after riding. It’s a shame as really we love the concept, the theming and most of the ride. It’s hard to rate something too highly that attempted to snap your spine. No Loose Items are allowed on the ride so all bags, wallets, and phones etc must be removed. Free lockers are provided while you ride. The Queue is a heavily themed experience that sees you head into a replica Egyptian tomb. 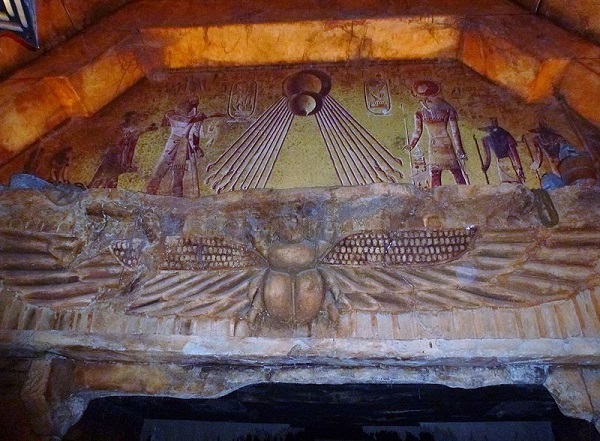 It is heavily themed with hieroglyphics, artifacts, and the odd skeleton. It is quite eerie with a few videos and into’s that help pass the time. The Intense theming continues on the ride as it sets off and warning of impending doom help up the fear as animatronics and video “holograms” make you fully aware of the error you made entering the tomb. The High Speed, but short track with sharp bends and sudden drops, combined with the darkness and hence the inability to either brace or ride out the jolts and jerks are what, we think, make it so painful. It is the only ride where we actually screamed in pain rather than excitement. The ride comes to a dead end when you are then launched in reverse through some more tight turns and sudden drops before some impressive effects end the ride with an unexpected arrival back at the loading bay. Overall it is a very good ride really and some of the effect and animatronics while not on the level of the Orlando attraction (Orlando’s Flaming Ceiling for example) are really well done and worthy of the hype. But the roughness just take the joy away for us. Maybe if it were not dark it might work better as you can see what’s coming up but this is no excuse we have ridden plenty of dark coasters without needing a chiropractor afterwards. We have included a video below of the ride with the lights on as this highlights the actual layout without spoiling the “effects” here you can see the problem with the tight layout requiring such tight turd and sudden drops that you do not see coming. But Watch with Caution to avoid Spoilers. Our Review of the Coaster is not really mirrored around the Web and the industry where the Coaster gets high praise. So we would love to hear your take on it? 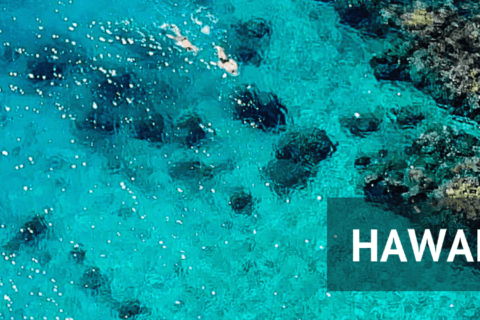 Are we just wimps and missing out on a great experience? Did you find it painful too? Is the spine-jarring worth the ride? Let us know in the comments below and don’t hold back! I rode the Mummy ride mid February 2019 and it wrenched my neck, made me extremely dizzy, and gave me a severe headache that lasted for days. 3 weeks later my neck still hurts and I have lingering headaches. The seats are hard and there is no lateral head support. I would warn anyone over 50 to not ride this. Ouch sounds pretty nasty, really sorry to hear this. We have come away with no lasting injuries, but it was pretty painful at the time. As you say the hard seats and poor restraints combined with the darkness so you can’t see anything coming can combine to a very violent experience. We are big Coaster fans and have ridden big fast coasters back to back all day and have never experienced anything like this. We must point out though most people do not get any lasting issues from the ride and thousands of people ride it daily with no issue. But it can certainly be a very rough, and jerky experience. Not one we wholly recommend to anyone, regardless of age!